MG today rebranded ahead of its 2011 relaunch. The car maker, which collapsed in 2005, was snapped up by China’s biggest car maker SAIC and has been biding time while its new masters planned how to revive this famous British marque. Now the new strategy is becoming clearer. MG is relaunching in the UK first – in summer 2011 with the arrival of the 6 hatchback and saloon. It’s a half-sized family car straddling the C- and D-segments, a bit like Skoda’s Octavia, and will be priced aggressively. The company says the MG 6 will cost from £17,000-£20,000 when first deliveries happen in April 2011. Only petrol engines will be available at launch; the new 1.9-litre turbodiesel lands in summer 2012, coinciding with the Continental relaunch. The MG 3 is the new supermini from China. It is due to arrive in late 2012 and at 4m long, it echoes the footprint of a traditional European mini such as the Renault Clio. MG’s initial launch plan is for those three vehicles: a pair of 6 bodystyles and the 3 five-door supermini. 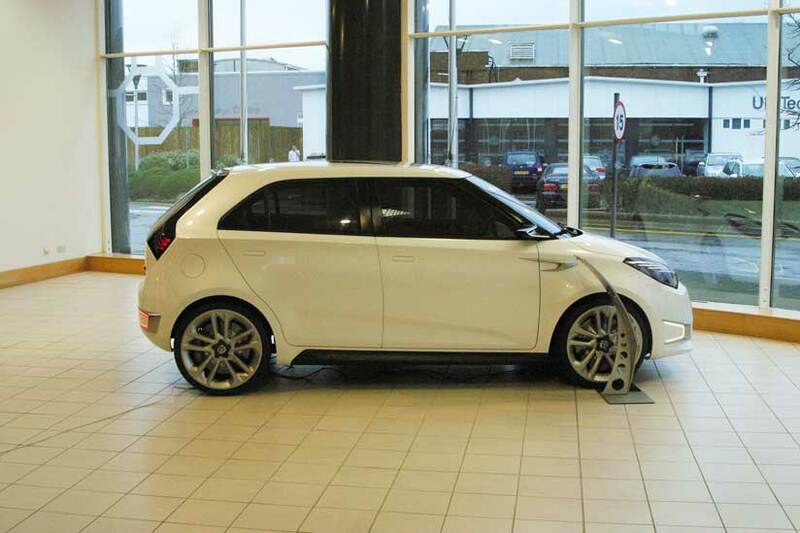 But Guy Jones, sales and marketing director of MG Motor UK, told CAR that two further models were under evaluation. ‘There are two unconfirmed all-new products we’re looking at,’ he said. ‘We do have crossovers and SUVs in the plan, but we have not committed to bringing them to Europe yet. MG has become a niche player in the UK since the collapse of MG Rover in 2005. It has sold no more than 374 TF roadsters per year since 2008 and the dealer network has all but dried up. However, Jones said there were 39 showrooms in the UK and the company was busy filling 45 open points in its network. All will wear the new MG octagon, unveiled today, with its red background and simpler form. The new MG company plans to design and engineer its new model range in the UK at the Longbridge site. Although a shadow of its former might, the Birmingham facility still has 60 acres and SAIC has invested £45m in setting up a design studio, engineering centre and preparing the mothballed factory. The MG 6 saloon and fastback are shipped from China 80% pre-built, are trucked from Felixstowe and the final assembly happens in the Longbridge factory, where the engine and transmission are married to the body, suspension is added and final electrical systems fitted. It’s easy to dismiss the MG revival as pie-in-the-sky. The world doesn’t need another niche player and competition is fierce with the Japanese and Koreans making life difficult for the established players. But the new MG is a very different operator from the old MG Rover. Where that company had grand ambitions, SAIC is adopting a softly-softly approach. It only wants to build 2000 cars in its first 12 months. The thing is, would you bet against SAIC – China’s biggest player – succeeding in the long run? The 6 we sat in today felt very modern, very together, and is bristling with kit. No, it’s not a stand-out design, but early test drives suggest it’s a good drive and the rate at which the Chinese progress industrially suggest MG could become a force to be reckoned with. It’ll take time but it’d be a brave man who bet against this succeeding in the long run. We would like to thank Marc Meccia, Michael Foster, Brian Chipetine, Bill Maxwell, Ed Murphy, Jim Lynch, Jim Pyatt, Karl Haldorson and all of the other contributors to this issue of the Octagon. Also thanks to Art Isaacs for his continued work in answering members’ technical questions and answers. Be sure to send in photos and stories so we can include them in future issues of the Octagon. We have a new website for mobile phone users at www.mgclub.mobi . It is easier to read on smart cell phones than the regular website. As requested by our members, Tech Sections Volume III in now available in printed format as well as CD format. It previously was only offered on CD. Pricing can be found on the regalia/store page and is priced the same as printed volumes I and II. Combos of more than one volume are also available. In addition to the items found in our regular club regalia / store, more store merchandise including tote bags, caps, sweat pants, shorts and other items can be found at our Fieldhouse Club Store located at www.fieldhouse.com/amgba. I am sure you have noticed the improvement in the look and feel of the Octagon. The pages are larger, the paper is better and the quality of the color pictures is considerably better with more vivid colors. We have made a change in printers to make a better looking magazine. Let me know what you think of the changes. American MGB Association members receive the Octagon, now published in March, June, September and December and the eOctagon, published in February, May, August and November. The American MGB Association Photo Gallery is located at http://photos.amgba.com . The same login is used for the Gallery as the Message Board. Members can place their car photos directly at this location. Start planning now for the show season!